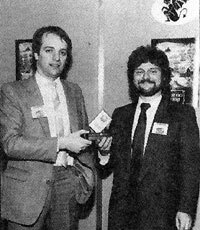 The two men responsible for Gargoyle Games, Roy Carter and Greg Follis (right), produced a consistently superb series of games during the company's four years as a developer and publisher. Gargoyle's games were renowned for their graphical excellence: their trademark was the "walking man" animation of their sideways-scrolling graphic adventure games Tir na Nòg and its follow-ups Dun Darach and Marsport, the first of a never-completed "Siege of Earth" trilogy. The company later branched out into producing arcade games in its own distinctive style, some published by Elite Systems and some under Gargoyle's Faster than Light label.